The defending-champion Giants come to town tomorrow to start a four-game series. They have, like the Reds, found themselves hovering around 0.500 so far this year. Matt Cain is on the disabled list, as is Jake Peavy and Hunter Pence, so they've unquestionably been hit pretty hard with injuries. As I write this, the Dodgers have a 5.5 game lead in their division, and are looking mighty tough. This year's iteration of the Giants have in many ways been the definition of average. Their pitching has been very solid thus far, despite their rotation injuries, and their on-base oriented offense has been right around average for an NL team. 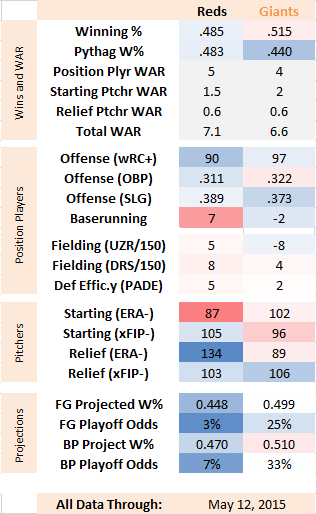 Fielding-wise, there is disagreement among the metrics I'm citing, with UZR not impressed, but DRS and BPro's park-adjusted defensive efficiency thinking they've been a tick above average. The projections think they'll do much the same the rest of the year. An interesting thing about the Giants team is that two of their top prospects are on their bench. Andrew Susac was promoted just under a month ago, and he starts 2-3 games per week, whenever Buster Posey isn't behind the plate. 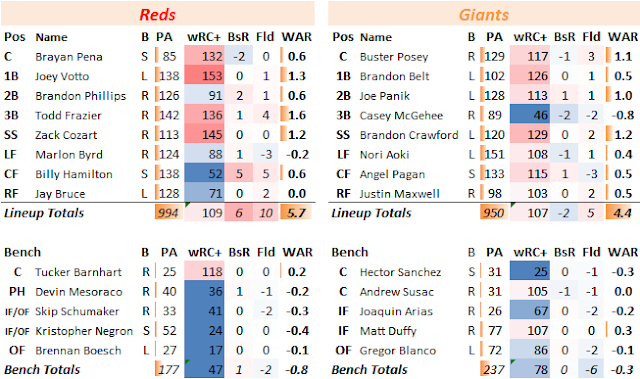 This hasn't happened in the past week, but I think the general plan is that Brandon Belt and Posey platoon at first base, with Susac stepping in for Posey at catcher against left-handed pitchers. The Reds don't have any left-handers, however, so we might not see a lot of Susac, who has been solid in limited appearances. Matt Duffy is the other good prospect, and is currently playing the super-utility role across shortstop, second base, and third base while the others are spelled. He's starting to hedge in on Casey McGehee's playing time at third. Aside from McGehee, everyone has been hitting thus far. I don't know about you guys, but I still get excited when Tim Lincecum comes to town. He's been pitching pretty well this year, maybe because his dad is back in the picture, though his peripherals suggest he's been more "fine" than "spectacular." Like most Giants starters, he's far more reliant on his offspeed stuff--especially his still top-drawer change-up--than his fastball. After that, we get to see Best World Series Ever (since Curt Schilling, at least) pitcher Madison Bumgarner, who has just been very good so far. I don't know much much about Chris Heston, but his excellence thus far would seem to be a surprise; in 280 AAA innings, his FIP was north of 4.50. I think that's Pacific Coast League, so yeah, league effects. But the 27-year old isn't likely to keep this up. Jason Marquis is no longer leading the league in strikeouts. In fact, he's now below-average. I'm hoping to see some improvement from Michael Lorenzen this go-around. The results have been good, but you can't be below-average in strikeout rate, walk rate, and ground ball rate and expect to have any kind of lasting success. That LOB% will dip. I felt like he was nibbling around the strike zone in his last start, so hopefully he can go after guys a bit more this start. I'm not including recent waiver-wire pickup Ryan Mattheus here because I'm not sure who will get sent down to accommodate him on the roster yet as I write this. I'll try to get a profile on him up soon, but the short version is that he's been a hard-throwing, low-k, high-ground ball rate guy throughout his big league career. Will he be better than Kevin Gregg? Well, he's 31 years old and has a career 4.24 SIERA. So, shrug? I think it's amazing that Jeremy Affeldt is still pitching for the Giants. He's been with them since leaving the Reds after the 2008 season. Aside from 2013, he's been superb in the lefty set-up role, though in the early goings this year he has struggled: he's walked twice as many as he has struck out.